August 23rd, 2016 – We’ve all heard this before: Love is all you need. So we wander into relationships with the best intentions to love each other. Only, without realizing our wounds or our partner’s wounds and without communication and conflict resolution skills, we often find ourselves in a relationship crisis. 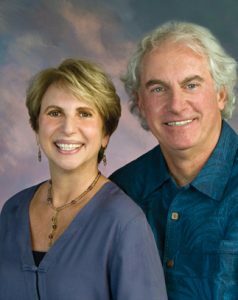 Our interview with Linda and Charlie Bloom uncovers a few cultural myths about love; their book that they coauthored together exposes even more. This is a fabulous introduction to love’s myths, its crises, and its many opportunities for personal growth. Linda Bloom, LCSW and Charlie Bloom, MSW have been married since 1972. Trained as psychotherapists and relationship counselors, they have worked with individuals, couples, groups, and organizations since 1975. They have lectured and taught at learning institutes throughout the USA, including the Esalen Institute, the Kripalu Center for Yoga and Health, the California Institute for Integral Studies, the Meridian University, John F. Kennedy University, the Crossings, Omega institute, the Institute for Transpersonal Psychology, University of California at Berkeley Extension Program, the Hoffman Institute, and the World Health Organization. They have offered seminars throughout the world, including China, Japan, Indonesia, Denmark, Sweden, India, Brazil, and many other locations.